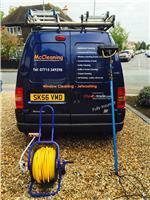 McCleaning - Cleaning Services based in Weybridge, Surrey. McCleaning are a friendly, trustworthy, professional and very reliable cleaning service. Uniformed staff who are qualified. We can offer you a regular window clean on our 4, 6, 8, 10 or 12 weekly round but we are also happy to do one off window cleans. As a smaller company we like to look after our customers by giving them half price cleans every time they introduce a friend or family member to our regular window cleaning round! At McCleaning we use the Water-Fed Pole System which allows windows, frames & sills to be cleaned to the highest standards. Dirt particles are agitated using a purpose made, soft bristled brush and rinsed away using extremely pure water. We have over 10 years’ experience with this method of cleaning and all the other types of cleaning services we provide. Jet Washing, Drives, Patios etc. Please call for a free, no obligation quote, we look forward to hearing from you! You can also visit our website www.mccleaningsurrey.co.uk for more information.